Love this ring. Super shiny and great size. Crafted with breathtaking shimmer and simple elegance, this engagement ring will add luster and romance to your look. 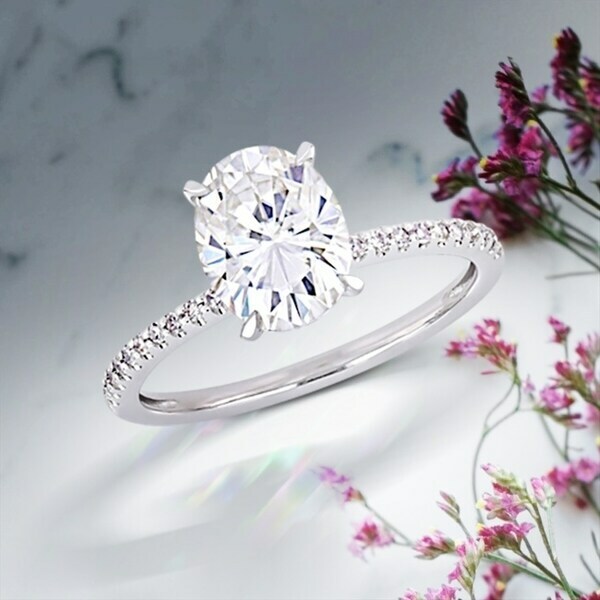 The ring feature a gorgeous oval-cut moissanite, prong-set over a thin 14-karat white gold shank. The shank is lined with shimmering white diamond accents that complete the sparkling appeal of this beautiful ring. All weights and measurements are approximate and may vary slightly from the listed information. *T.W. (total weight) is approximate. 1/10 carat T.W. may be .08 to.12 carat. Treatment code N (white diamonds) and CR (moissanite). See Treatment Guide for further information. Beautiful ring, so clear and sparkles more than any diamond. Moissanite is a truly exceptional stone, and this ring really shows it off. Price for the value is incredible! I've been searching for just the right engagement ring to replace mine that was stolen and this ring is something I am very proud to own. I have slim fingers so the oval shape of the main stone is very complimentary. 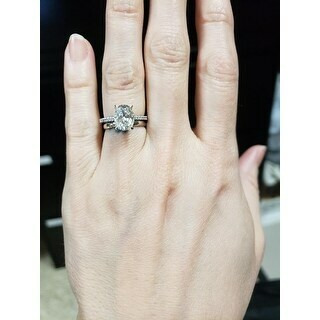 I was a little concerned that a 2 carat stone would be too large, but surprisingly the size is worth it, not too big and not too small, and with the thin band the dimensions play nicely with each other. I literally can't wait to put it on each and everyday and find my self admiring it more than I care to admit :) Also being intrigued by astronomy, I was in love with where this gem originates from. This was the perfect find and I am thrilled with my purchase. 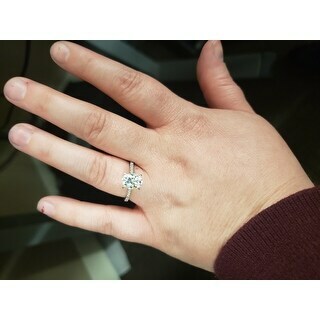 It is a gorgeous ring. Just look fabulous. I will have to return and order another because I lost weight and actually need a smaller size. I can't wait to get here. I just don't post pics now cause once I will return, it's already back in the box, but I will post pics when the one in the right size gets here. I love this ring! I would definitely recommend this to anyone. It is beautiful. 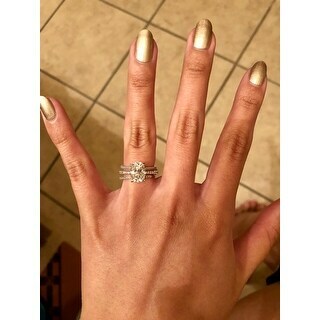 This is the most beautiful ring! I accidentally threw away my original engagement ring in a rubber glove in the operating room. Unfortunately it was not insured. I wanted something beautiful that wouldn’t break the bank. I love this ring! 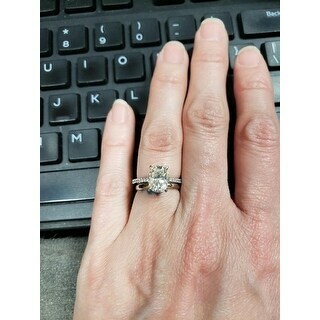 It sparkles and shines and looks great on my petite hand. I definitely would recommend it. this ring is gorgeous I would highly recommend! This ring is so beautiful. So perfect, exactly what I wanted. It's so sparkly, I can't stop staring at it. The band is so dainty and small, it barely feels like I'm wearing a ring at all. I'll definitely be getting a matching band or 2. I absolutely love this ring although the next day it went on sale for $*** less. Costumer service was wonderful in handling the difference. My girl loves it. "Does anyone know what color the Moissanite is? HI or J?" "Do you have collection of two tone gold white an rose plus about 1.25 center 2-3mm"
Wanted a ring to go with my band.